The trip started in 1996. Katie and I were on a full service motorcycle tour in the Alps and Italy. 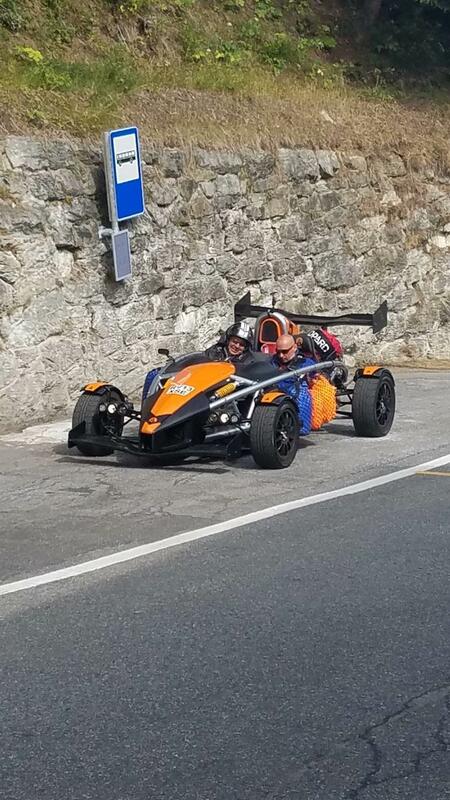 The “best” Alpine pass for that tour was Gross Glockner in Austria. It snowed and the pass was closed when we got there. I vowed to return! In 2018, we did! Katie and I started planning this in 2017. I contacted Ayres Adventures, with whom we had done 2 full service motorcycle tours before. I asked if they could help set up a self guided tour. They were happy to help. I told them the parameters: Ride Gross Glockner pass, Stelvio pass, the Dolomites; 10 days of riding; max 200 miles per day; at least 2 nights at each stop; 3 star hotels; start and finish in Munich. Ayres arranged for the rental of the motorcycles (2 BMW RTs), the hotels and provided suggested routes and waypoints for the 10 days of riding. Riding with Larie and Katie Trippet were Jim Conley and Rosie Painter. We arrived in Munich, Germany 2 days early and visited the BMW World museum among other sightseeing. The BMW R1200 RTs were delivered to the hotel on the afternoon before we started riding. We packed the side cases and were off in the morning. The suitcases stayed at the hotel. The delivery of the bikes was not without a scary moment. I chose the red bike. The rental guy couldn’t find the actual key, but the bike would start. He decided that the electronic key was locked in the trunk, along with the trunk key!. He drove back to his home to retrieve backup keys for the trunk. I took the bike to the underground parking garage. There the bike would not start, so I assumed the key was in his van. He came back about 2 hours later with about 100 trunk keys. On the 95th try, we found a key that worked, and yep, that is where the key was. Day 1 took us over Gross Glockner pass. A beautiful day. We went up to the high point named Edelweiss Spitze for a spectacular view. On the way to Gross Glockner, we stopped for a snack at the home of fellow motorcycling Rotarian, Anton Mosshammer. A great way to visit with the “locals” while having Rotary and motorcycling as our common bond. Anton is willing and enthusiastic about helping others organize motorcycle tours in the region.We ended the day in Lienz, Austria. In the hotel I found beer in a vending machine in the lobby! Day 2 was a loop to the east of Lienz. Beautiful mountain riding with several minor passes. The highlight was Lake Millstatt for a lunch stop. In Lienz, motorcycling Rotarian Pilli and Krista von Prancke joined us for dinner and for the ride the next day to Bolzano. Very nice people. Day 3 took us from Lienz to Bolzano, Italy via several major passes. We stopped for coffee at beautiful Lake Misurina. Unfortunately we got separated from Pilli and Krista. We made it to the top of Passo di Falzarego. I think I made a wrong turn and we missed Passo di Giao. That may have been a blessing. Pilli and Krista ran into a heavy thundershower, while we avoided it. We also did Passo di Pordoi. Day 4 was a loop through the heart of the Dolomites. We circled the Sella Group of mountains. Day 5 the girls decided to take a day off the bikes. Jim and I went on a loop which included Mendel pass. It was to the west of Bolzano. We avoided some thundershowers. The weather had cooled down a bit from when we started. That is about 6 to 8 ft wide! Thankfully it recalculated a better route and we got to the hotel safely! Also, while leading Pilli and Krista earlier, the GPS lead me through a pedestrian-only area. Boy, did I feel out of place. Day 7 was a free/rest day at Lake Como. We all decided to take the ferry across Lake Como to Bellagio and then to Varenna. In both places we toured villas, gardens and lots of high end shops. I did find a restaurant serving “craft beer”. However, nothing like we have here in the good old USA! I am spoiled! Day 8 was a ride from Lake Como to Pfunds, Austria. We had a route planned to go over Stelvio and we took that route. Before Stelvio was Gavia pass. 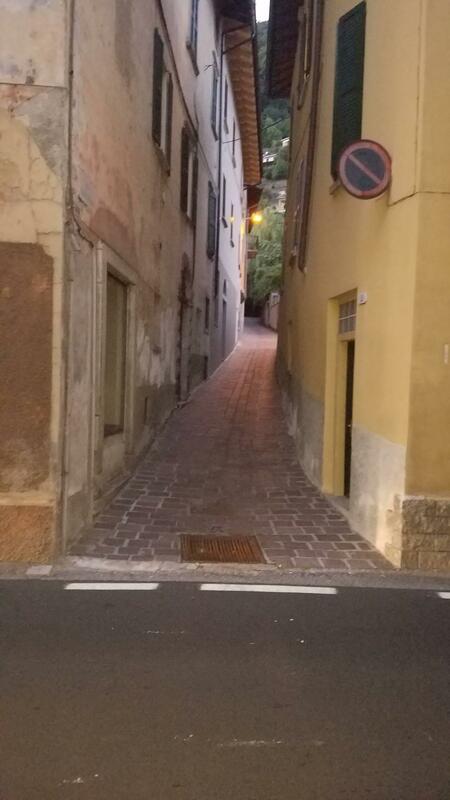 VERY narrow road with VERY sharp switchbacks, 2 way traffic and no guardrails. To be honest, I was a bit freaked out, but made it successfully. After Gavia Pass, we came to Stelvio Pass. 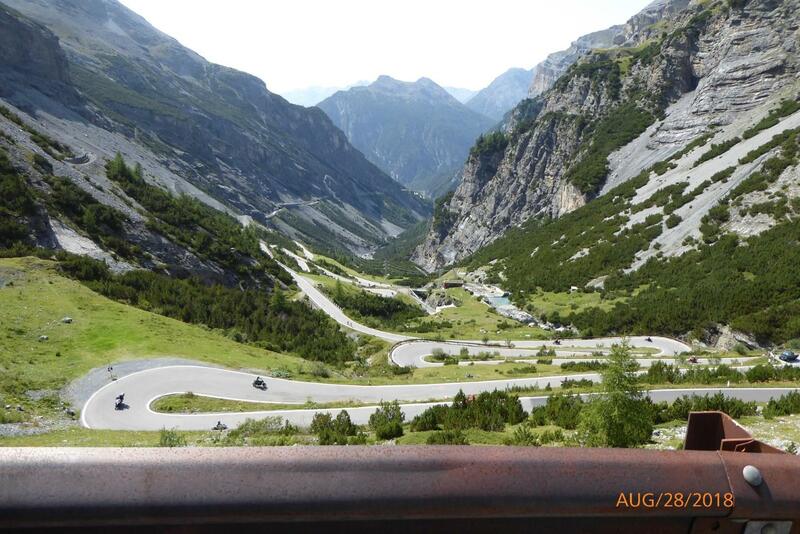 There are 3 roads up to Stelvio pass: 1 from Italy, 1 from Austria and 1 from Switzerland. We arrived on the road up from Italy. The famous side is the Austria side. It has 50 switchbacks and you can see most of them from the top. That is the famous picture! We stayed at the top for a bit and we could see way down the road there was a truck or a bus that was blocking one of the switchbacks. Dead stop traffic was growing. After ½ hour, there was no budging of the blocking vehicle. We decided to go down the Switzerland side. A bit of a disappointment at the time. Which brings us to day 10, our last day on the bikes. We are riding from Pfunds Austria back to Munich. We had some very slight drizzles on earlier days, but today we had intermittent light, rain almost all day. We made a brief stop at a very large cathedral and then on to Ludwig’s castle. No pictures allowed inside the castle. It was huge and fascinating. Walt Disney used this castle as the model for his castle at the original Disneyland. We arrived back at the same hotel in Munich rather tired after a long day. We unloaded the bikes and they were picked up at about 9pm by the rental company. Everything was in order. 1188 miles!! Now we start our trip to the Amalfi coast!! The next day was a private boat tour of the Amalfi coast. Very relaxing and great views. We stopped at a restaurant for lunch that you can only get to by water. We swam a bit. The salty water made us float very easily. That night we had a dinner high up on the mountain at a restaurant with a great view. Many courses of food served family (sharing) style. Unlimited wine, too! The next day was hiking the Path of the Gods. This clears one of Katie’s bucket list items! We had a guide which was very helpful to learn more about the area. We packed the suitcases and left the motorcycle gear at the hotel. We flew to Naples, Italy for a 2 night stay. This part of the trip was organized by Katie using a tour company called the Roman Guy. It was a custom itinerary just for us. In Naples, we had a guided walking tour of the old part of town, including a fort in the harbor, just blocks from our hotel. The next day was a guided tour of the Archeological Museum. This was a great introduction to the ruins of Pompeii and Herculaneum which we will see the next day. The eruption of Mt Vesuvius lasted for 3 days and had different impacts on Pompeii and Herculaneum. Herculaneum had a flow of material (not like the lava we see today, but thick and hot) which covered the town. Pompeii had ash and stone fall from the sky to bury it….27 feet! They have been excavating Pompeii for 250 years and there is still more to unearth! The next day we had a driver drive us from Naples to Positano on the Amalfi coast with stops at Herculaneum and Pompeii. It was interesting to see the towns and hear the history. Pompeii was huge. Fortunately our guide kept us moving to see all the highlights without wasting much time. They had “fast food” spots, 2 and 3 story houses and lots of shops. Very interesting. Positano is a great little city on the Amalfi coast. It has a 1 way road thru the town. Our hotel was much higher in elevation than the seaport. And the best way to get around is to walk…up and down! Our hotel was right on the road, so no hiking to get from car to hotel. About 800 steps from the hotel down (and back up) to the seaport. This is the restaurant associated with the hotel. The kitchen on one side of the road, our table on the other side of the road. 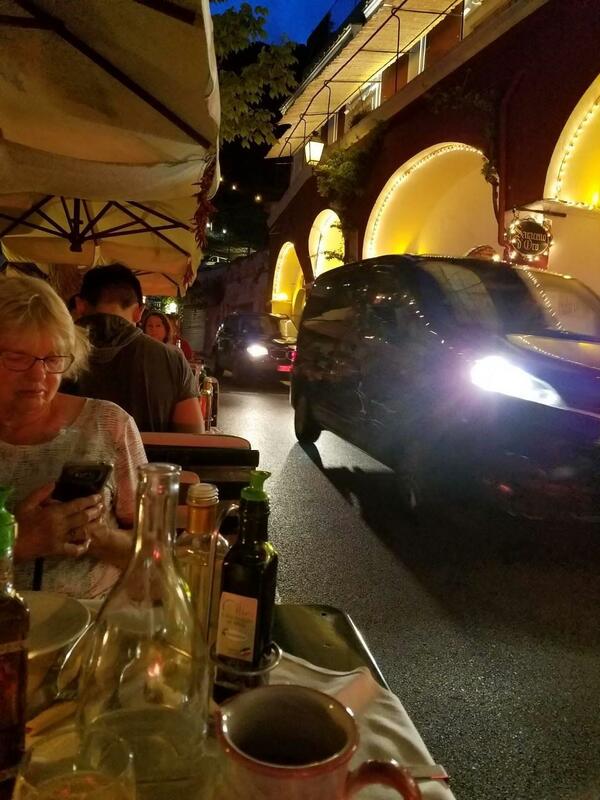 Cars passing within 2 to 3 feet of us while we ate. This was not uncommon! And the history. The path had a few challenging spots, but not too bad. There are a few different routes going up or down and starting at different spots. We started in Bomerano, took us about 3-4 hours, ending with lunch in Nocelle. From Nocelle we took the public bus back to Positano. The next day we took a ferry over to the island of Capri. We had the same guide as the day before. He recommended that we walk to the Roman ruins of Tiberius. He thought it a waste of time for him to show us all the shops in Capri. From this villa on Capri, Roman Emperor Tiberius ruled all of the known world. We learned a lot more Roman history as well. The next day was another hike from Ravello down to Atrani and then to Amalfi. We all went to Ravello to visit 2 Villas. Beautiful gardens and views. After that, Katie and I tried to hike down to Atrani. We got bad directions 2 or 3 times, but did manage to find our way. Jim and Rosie took a bus down. We met in time to catch the same ferry ride back to Positano. The next day we had a driver take us about 2 hours to Paestum, Greek ruins from about 500 BC. Our driver decided to avoid some traffic and took a “shortcut”. No, he got lost, twice. We missed the scheduled mozzarella tasting and after a very quick lunch, was ½ hour late to the guided tour. In Greece, you are not allowed to enter the ruins. Here we were welcome to go in! Absolutely amazing! This preceded all the other Roman ruins we saw. On the drive back, the driver got lost AGAIN!!! We asked that he stop at a couple of ceramic shops for shopping. Didn’t find anything. The next day, we had the same driver to take us to the Naples airport. He didn’t get lost this time. One last visit at the Munich hotel with the International President of the Motorcycling Rotarians, Dirk Jesinghaus and his wife Cornelia. We packed everything up and the next day flew back to San Francisco. But a 6 hour layover at SFO made the day pretty awful. But got home safe and sound. An incredible time was had by all! !